This month's lovely sponsors are a wonderful, creative, inspiring group of lifestyle bloggers, artisans and independent shop owners. I hope you'll enjoy them as much as I do! - Dell Cove Spice Co. carries everything you need to make barbecue and outdoor parties season a success (cocktail rimmers! Mojito sugar cubes!). I bet their gourmet BBQ spice and dry rub sampler would make some dads happy on Father's Day. - Meet the lovely Shell of Kitty and Buck, who blogs about creative inspiration, photography, travel, fashion, books and picnics -and also throws in the occasional DIY and recipe post. I am amazed by her fabulous hair! I couldn't pull it off, but if you can, she shared the full how-to on how she dyes it in pastels and brights. 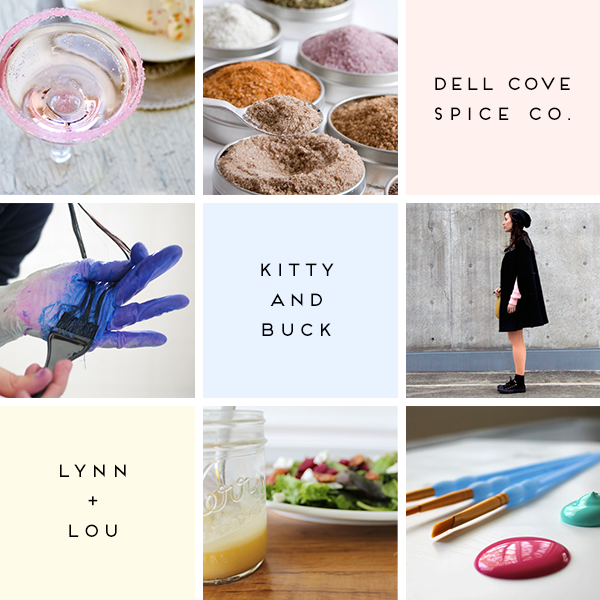 - Lynn and Lou are two equally awesome sisters conquering the blogosphere with DIY projects, scrumptious recipes, design and fashion inspiration, and daily happenings. Their endless creativity blows my mind. - Calinteya carries delicate handmade jewelry, hand knitted cowls to keep you warm, and clever framed cross stitch. - Debbie of In Whirl of Inspiration's witty and funny writing always makes me leave her blog with a smile on my face. 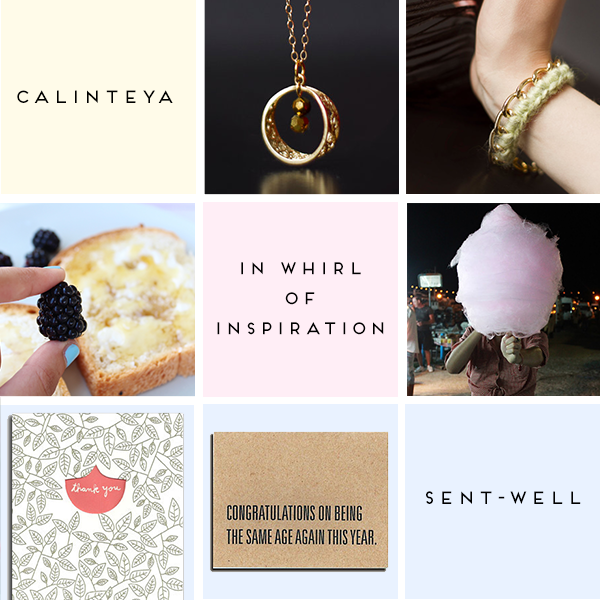 She shares things she admires and inspire her, from crafts to recipes, to movies, to books, to travel, and basically anything pretty or amusing. - Sent-Well is a unique online greeting card service. Choose your card (there are plenty different styles and occasions to choose from) and let Sent-Well do the rest! They will write your personal message out by hand, address the envelope, stamp it, and send your card in the mail to its lucky recipient. As easy as an e-card, with the personal touch of real cards sent the old-fashioned way! Those are such pretty pictures! Your blog is stunnig! Love it soo much!! Thank you so much! I am inspired by you as well, and impressed by your creativity! Thanks so much Shell, you're the sweetest! These all are lovely thing which is share by you.Also very useful in daily life. A very excellent blog post. I am thankful for your blog post.